Everything you need, but not too much of anything. Modern design with single boxspring beds, walk-in shower, flat-screen TV, laptop safe and telephone. The smart choice. Our Urban rooms feature wider boxspring hotel beds ( 1.20m-1.40m ) and face either a quiet side street or the inner courtyard. Our best choice for 2 people or business travellers who would like more space. A boxspring hotel bed, flat-screen TV, laptop safe and a walk-in shower complete this room. A room with air conditioning? Enjoy the luxury of a cool hotel room. Indulge yourself – with this chic Superior room. Fully air conditioned with a walk-in rain shower, heated bathroom floor, boxspring hotel bed, flat-screen TV and laptop safe. Perfect for a relaxed stay. 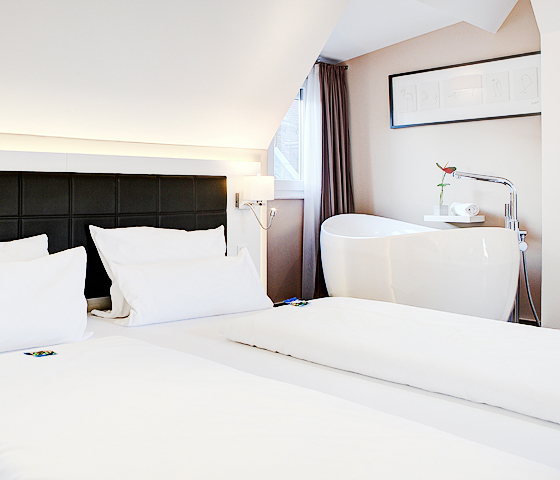 Pure urban lifestyle – with elegant design, state-of-the-art technology and a free-standing bathtub. Enjoy the 30-m² rooftop terrace with sun loungers, a 55-inch LED TV, air conditioning, bathroom with a rain shower and heated floor. Indulge in luxury. Our apartments are the perfect temporary home. Small, excellent, everything is there. The perfect serviced apartment for the short to mid-length stay. 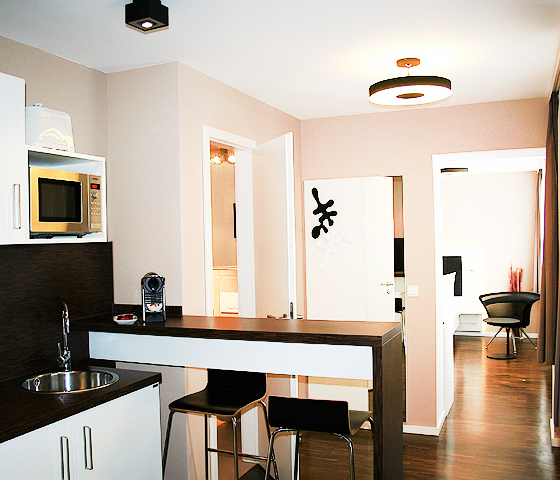 Fully equipped kitchenette including Ceran stovetop, microwave, sink and a self-catering bar area. A working area with LAN connection, LCD flat-screen TV, boxspring hotel bed and laptop safe. A business apartment for a smart stay. More space, more features, more comfort and fully air conditioned. Our generous Premium studio is the most suitable choice even for long stays. Enjoy a walk-in rain shower, heated bathroom floor, great hotel beds, flat-screen TV and laptop safe. Our best studio for an unforgettable stay. A romantic weekend or relaxed business stay? This quiet, courtyard-facing apartment is perfect for everyone. Take the spiral staircase up to the private rooftop terrace with sun loungers. Equipped with air conditioning and a large bathroom with rain shower. Perfectly arranged, chic design and simply lovely. Space for large families. There is room for everyone in our large apartments. Our Master apartments are true 2-room apartments with a clear division between the living and dining areas and the separate sleeping area with working space. The large, fully equipped kitchenette, the generous bathroom, 2 LCD flat-screen TVs, the boxspring hotel bed and the laptop safe will complement your stay. You will want to stay here. Our Junior suites are designed as 3-room apartments whose separate bedrooms offer space for 1-4 people. In the central living area featuring a dining table, LCD flat-screen TV, comfortable sofa and kitchenette, you will feel quite at home. For families, for people who need more space, for happy guests. The name says it all. Generous, high-quality urban living ambience with 2 bedrooms, a built-in kitchen, dining area and living room. A spa-style bathroom with walk-in rain shower and bathroom – the toilet is separate. Relax on the sofa with the Bluray DVD player and stereo system or cook, eat and work. 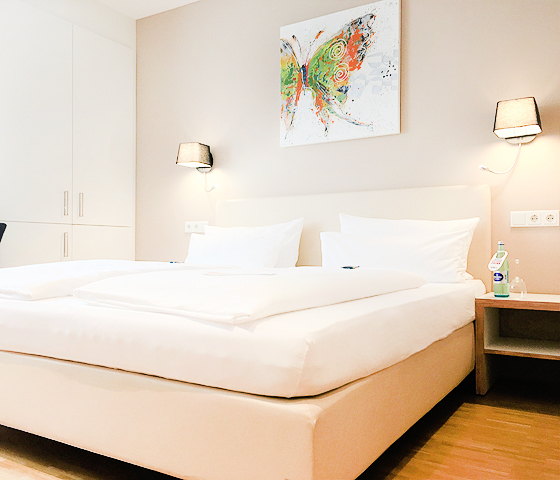 Everything has been prepared for your unforgettable long-term stay in Erlangen.